I originally wrote this as a Facebook comment on my personal page, but after reading it again, I realized I was asking others to stand up and take ownership, take action and take control of this situation. I decided it needed to be reposted on the blog. I rarely get super political here, but … babies. BABIES, guys! Taken away from their parents with ZERO plan in place to reunite them, shipped all over the US. I’m sick to my stomach with it. Sick to my stomach watching people around me comparing them to common criminals, drug dealers, thieves or worse. These are not the children of criminals. They are the children of parents who wanted better lives for their families and were fleeing the nations most of you won’t even go visit on vacation because you KNOW it’s not safe. We need to talk about this. We need to deal with it. We need to own it and spread this and do something about it. I think the issue is getting too confused, here. We’re getting caught up in side-arguments about laws and rules and protecting borders and “what about the poor Americans?” We are getting stuck on trifles when the Mount Everest-size problem staring us all in the face is being pushed to the background. Friends, look. Screw the law, screw the blame. I don’t care. I care about what we are going to do about these draconian solutions to a modern day problem. I care that children are treated like items, not beings. These are living, breathing, babies and children of all ages who are completely innocent in this situation are being the pawns in a pointless game of chess. I mean, blame whoever you want if you really need to, but that’s not what I’m talking about. The “who did it” question is the farthest issue from my mind. How many times this may or may not have happened before has absolutely ZERO to do with this and is in NO WAY a reason or excuse to justify what is happening now. My only concern, my ONLY CONCERN is – who is going to help these children? Who is going to put these babies back into their father and mother’s arms? HOW are they going to do it?? Having small children of my own, one of them being special needs and alongside having a degree in psych, doing thousands of hours of personal research on child development and neuropsych… the facts are clear. It doesn’t take a scientist to understand that what we are doing to these children will leave a lasting impression, a negative impression, deep within their hearts and subconscious minds. Stop bringing up “well, democrats” or, “but republicans” and “if he hadn’t” and “but they did”. You all sound like 5th graders on a playground when no one wants to take ownership for the kid with a broken nose. GROW UP and own this. ALL of us need to becuase at the end of the day, it doesn’t matter whose law it is or who is at fault or who shouldn’t have broken the law by coming here. It matters that these children are being removed from their parents. They’re being shipped all over the country at this point. Small children, put in “tender age” care centers that are basically bare-bones versions of daycare centers, left to scream and cry for hours. They are screaming and sobbing inconsolably, they said. The caretakers do what they can… They try to comfort them, but these babies are terrified and there is too much to do to comfort each of them the way they need to be comforted. The impact upon the brain with this type of trauma and longterm exposure to the fear response can have lifelong consequences. if you don’t think this is going to cause lifelong harm to their brains and bodies, you’re wrong. Look up Cortisol and the constant state of fight-or-flight their entire bodies are being subjected to while in these places… the impact on the brain from heavy, early childhood fear response is devastating to brain development. it WILL impact them. Even older children and adults… too much of that over a long period of time… it WILL damage them. Behavioral problems, inability to self-regulate, apathy, inability to cope with change, depression, anxiety, PTSD, breathing problems, heart problems, gut problems… all possible for any of these children at this point. We are creating monsters who will hate us -all of us- for the rest of their lives. It won’t matter if we, personally wish we could do something to help, it won’t matter if we, personally grieved alongside them at these losses. They’ll hate ALL OF US for this. Not just the “white people”, but Americans. ANY American. No matter what you look like, where your parents come from – ALL OF US. We’re dangerously creating enemies who have suffered trauma at our hands. This is not the age in which to create enemies… enough people hate us already, don’t you think? And what happens after? How are these tiny children, the babies, toddlers, non-verbal ones too afraid to speak… How are they being catalogued and documented to ensure safe return to their families once this is over?? How will these desperate parents find their children later? They said the children were being divided amongst a few different facilities and move depending upon overcrowding and needs. How are they keeping track of who has whose children?? 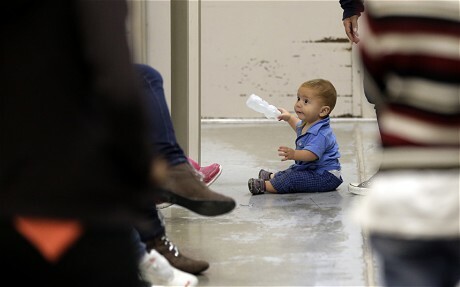 What are they doing to ensure these babies actually CAN make their way to their families again? Apparently there’s some kind of hotline where the detained parents can attempt to reach their children on the phone, but according to the story I heard this morning, they rarely get permission to use it and it doesn’t always work because children are moved and parents don’t know where their kids are and no one wants to take the time to help. 1, Where are my children? 2, Who is taking are of them? …and NO ONE can answer any of these questions in specific terms. Ugh, it hurts my heart… See, I don’t care who is causing this. I don’t care which party invented the idea… I don’t care if you love the president or hate him. I don’t care who broke whose law… This conversation and call to action is not about any of those issues. This is about how we (WE- AMERICA – ALL OF US) are failing the innocent parties in this process by treating them like baggage and possessions instead of human beings with souls and rights and futures yet to be written. How we handle this will determine THEIR futures, their feelings, their brain power, their self-worth and whether they become an ally or an enemy. Regardless of the law, we MUST do better for these children for their safety, AND our own.